Wireless keyboard offers a compact size with a familiar layout, three-year battery life and instant access to the things you do most. 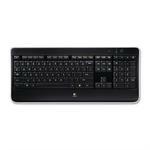 Wireless Touch Keyboard K400 offers lean-back wireless control of your laptop even when you're connecting it to your TV. You can control your laptop without getting up from the couch thanks to the 10-meter (33') wireless range. Wireless keyboard features laser-etched, backlit keys that you can see easily in any light.